Don’t hesitate to set a specific dress code for your wedding. A dress code is not an imposition on your guests. It’s a favor to them, giving them direction and saving them a lot of time and misguided effort. Just make sure you understand what your dress code actually means. Maybe you and your fiancée are totally chill. “We just want everyone to feel comfortable,” you say. Then you wonder why your guests arrive dressed like Kid Rock. Don’t worry that you’ll sound like a fashion dictator. A dress code is helpful for your guests, especially the men, who may have no clue what they should wear. Which dress code you choose will be determined to some degree by what the bride is planning to wear. 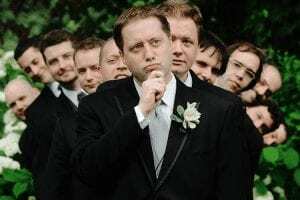 The wedding dress is the star of the show, after all: if she’s wearing a modern-looking sheath dress, it won’t do for all the guys to show up in tails, top hats, and spats. The problem with dress codes is that people don’t always understand them—including the hosts. That’s why you need to have a good picture of how you want people to dress, and you need to be able to explain it easily. Then there’s the question of strictness: some dress codes are flexible, while others will break if you try to bend them. 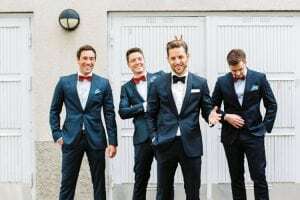 We’ll fill you in on what each dress code means for your male guests: just your male guests, because 1) men’s formalwear is relatively straight forward; and 2) women’s wedding fashion deserve an entire website to itself (hundreds, in fact). This doesn’t mean “a black tie:” it means “a tuxedo.” You might also say or see “dinner suit” or “jacket” (the matching pants are implied, one hopes), especially if you’re not American. Or “cravate noire”, if you’re French (or just pretentious). A proper tux isn’t the same as a black suit. A tux has contrast lapels in a shiny fabric like silk or grosgrain, and braiding down the sides of the legs. 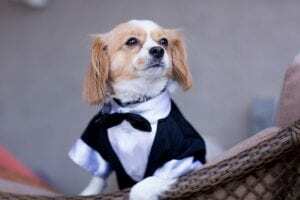 A proper tux shirt will be white, often with detachable studs and holes for cufflinks instead of buttons, some kind of a fancy front, and a turn-down collar. Wing-collars aren’t completely wrong, but they’re supposed to be worn with white tie (see below). You can get away with a normal white shirt but it should at least be double-cuffed. Your shoes should be polished black Oxfords or plain lace-ups. (As we’ve said before, shiny patent shoes are by no means a fail, but they’re really meant for white tie.) Velvet slippers are admittedly pimp, but they’re supposed to be for “at home” events. 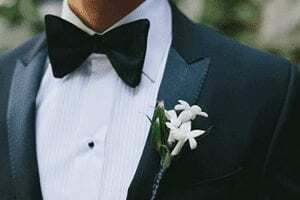 A cummerbund is like your appendix: not essential—though it can be handy to cover that bit of shirt between your jacket button and waistband. This is what hosts say when they want their guests to wear black tie, but don’t want to appear to be forcing them to buy or rent a tux. You should still wear a tux though. 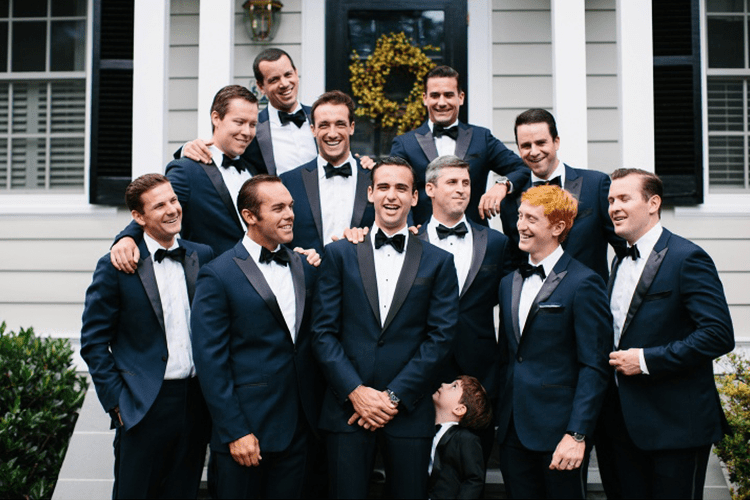 If you’re the groom, then man up, put “black tie” on the invite and be done with it. The point of black tie is to promote uniformity among the menfolk, and to let the women’s outfits be the focus of everyone’s attention. It’s not an invitation to experiment or express your personality. “Black tie creative”—or “with a twist”—is the exception. The hosts want everyone to know that even though they’re getting married, they’re still hip. Or maybe they work in a ridiculous industry like fashion. What does it mean though? A jazzy bow tie or pocket square. A tux in an offbeat color, pattern or fabric instead of the usual black (although midnight blue is historically more correct, and blacker under artificial light). A chambray shirt. Trainers. Go zany: no one will complain. While “lounge suit” might bring to mind a velvet number from the ’70s—and don’t let us stop you—what it really means is any suit that isn’t a tux. Well, not any suit: business dress is still out. To look like you’re going to a wedding and not to work, you go for pointy peak lapels, double-breasted or three-piece. Or a ritzier fabric like mohair. Or a dandyish tie and pocket square (coordinated, but not exactly matching). Colored or patterned shirts aren’t beyond the pale, but plain white is still your smartest option, as are black shoes. Put down the tiny umbrella: this means a suit with an eveningwear vibe, which is to say dark, sleek and maybe even a teensy bit shiny. Again, white shirt and black shoes, plus muted accessories. You’re basically verging on black tie. Strictly speaking, this means black tie. But it’s sometimes used (wrongly) to mean cocktail. And if it’s preceded by “full,” it actually means white tie. Confused? So is everyone else. For most of us, a tux is as swanky as it gets. But it was actually invented as a more casual alternative to “cravate blanche:” black tailcoat, trousers and patent shoes; white waistcoat, wing-collar shirt and bow tie. The only wiggle room is with the optional black top hat and white gloves. The daytime equivalent of white tie: a black or grey morning coat with tails, plain grey or grey-and-black striped trousers, a waistcoat (usually a lighter grey, or beige), a shirt with turn-down collar (usually white, though light colours, often with a white contrast collar, are not uncommon), a tie or cravat (a tie is better, trust us) and polished black shoes (not patent). Again, a top hat (black or “less formal” grey) and gloves (grey) are optional. Most likely this just means lounge suits or cocktail, but it can also mean white tie or morning dress, depending on whether the ceremony is in the morning or evening, and how traditional—and rich—the hosts are. Another minefield without a map, this probably means lounge suits. It almost certainly doesn’t mean “smart-casual.” Which is good, because nobody knows what that means. 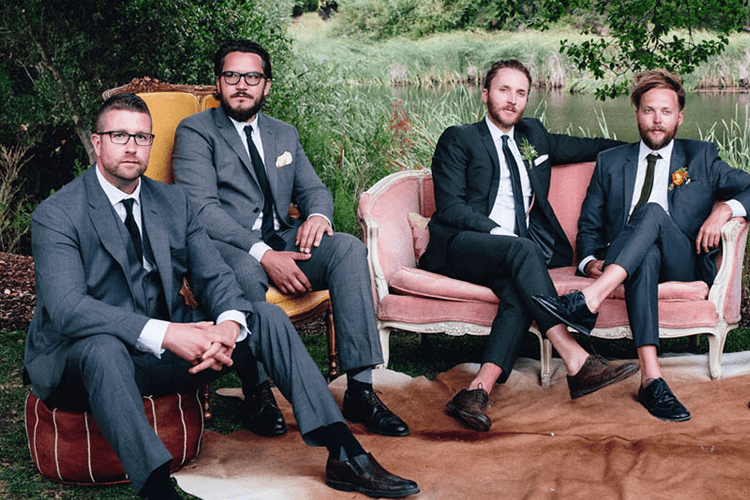 Designating a dress code will help your wedding party and guests get in the right ballpark. As the hosts, just make sure you and your bride are clear on the code you put on your invites. Honey, did you use all the eye shadow!? Find the right balance between sophisticated and fun. What Is Semi Formal Attire? No, it doesn’t mean you need a tuxedo, but it doesn’t mean your Jorts are going to finally have their day either. Don’t blow your suit-shirt combo with an overly blinged-out watch or a pair of colorful novelty socks. Impress everyone from the maid of honor to the groom's father. Ever wonder where the term "improve tenfold" comes from? If you're grown enough to have a wife, you’re grown enough to tie your own tie. 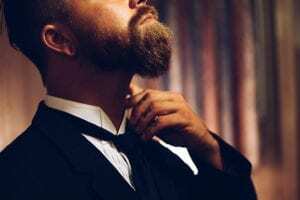 Stop looking like Deadpool at your wedding by shaving the right way.